Mechanical keyboards have had something of a resurgence of late, but nowhere have they been more popular than in the gaming community. 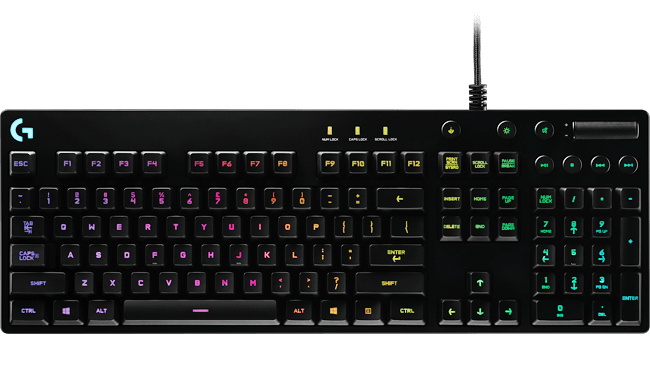 Logitech, one of the most popular accessory makers out there, has long made gaming keyboards, but it’s focusing on the e-sports market more than ever with its new, $130, G Pro keyboard. Like the G Pro mouse, the G Pro keyboard is supposed to represent Logitech’s highest performance achievements with minimal fluff. While it still has RGB lighting (I mean, the gear has to shout GAMER somehow) the chassis itself is refreshingly minimalist. It’s all black plastic, but it has a surprising degree of heft to it, so it won’t be sliding around your desk. Moreover, it’s a tenkeyless design (meaning it forgoes the number pad), making it compact and easy to carry to a LAN party. I hate numpads as they only get in the way during intense gaming sessions, so I’m happy about that. If anything, I wish the keyboard was even more compact. Meanwhile, the cable is a detachable, reinforced Micro USB port, which is a nice touch should it ever get damaged. Like most of Logitech’s gaming keyboards, the G Pro uses proprietary Romer-G switches. They’re a little hard to describe, but the closest analog I can think of are Cherry MX browns with a higher actuation point. They take a little getting used to, but I’m quite fond of the combination of tactile feedback and quick actuation. Going back to the RGB lighting for a second Logitech’s implementation is one of my favorites. Romer-G switches were designed specifically to provide a specific lighting channel through the keys (as opposed to the more common ‘underglow’ most keyboards have. You can program each key to virtually any color you want, along with a robust collection of customizable effects (including changing lights according to in-game events). There aren’t any dedicated macro keys, but you can assign them to F1-F12. For over 100 bucks, I would have appreciated a volume knob like on the G810 – but at least you have a shortcut via function button combinations. Of course, speed is the keyboard’s main selling point, and in fact, Logitech says its new signal processor is “up to 10 ms faster” than the competition. I’m not going to sit here and pretend that I can tell with certainty the difference a few milliseconds make in my gaming performance, especially considering I mainly play more mouse-heavy FPS games. I’m not even the quickest typist around. But somehow, I did seem to play a bit better with the G Pro than on my cheap old mechanical keyboard. My movement control seemed just a bit more precise with the G Pro. Counter-strafing in CS:GO felt more effective. Somehow a keyboard, of all things, was helping me get a few more headshots. There are only two custom buttons on the keyboard. A ‘game mode’ deactivates the Windows key and some others. Oh, and the keyboard is pretty great for typing too. Fancy gaming accessories aren’t going to turn you from a noob to a pro in an instant, but they can remove bottlenecks to let you to play at your highest current potential. The G Pro is one of the best keyboards I’ve used, even if I prefer even more compact designs, and I appreciate some of the restraint Logitech is showing in not overwhelming the keyboard with features. Then there’s that price. At $130, the G Pro is definitely overkill for someone like me (though there are plenty of expensive keyboards). Unless you’re super L33T, you’d probably be better off with any of a myriad of cheaper mechanical keyboards. But hey, overkill is what gaming is all about, right? If you want a reliable keyboard that provides both a great typing and gaming experience, you can’t go wrong with the G Pro. Just prepare to pay up.